We were celebrating an afternoon spent reclaiming the self-sufficient heritage that since the 1950s has almost been lost. Despite the sneering of many who do not share our love of hill country food, we relished the day spent cubing and rendering about 30 pounds of white pork fat to put by for the winter, and to give at Christmas to a few select family and friends. 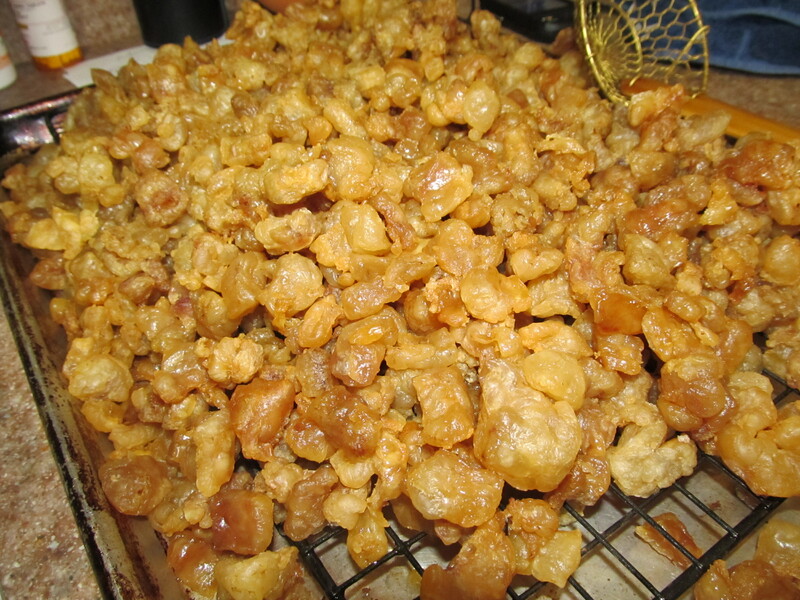 cracklin's cooling. Photo by Tonia Moxley. backwoods treasure. And the “cracklin’s,” which are the crunchy bits left after the rendering, would go into cornbread. Some had already told me to keep my lard. Which at first made me chuckle, because initially I enjoyed the shock factor. But after a while the condescension got to me. Rural foodways are still good for a sneer – even among the people who are their heirs. Lard can be found in ethnic markets, especially Mexican grocery stores and even in some supermarkets in areas with immigrant populations. But leaf lard, the highest grade of lard, is special, and harder to find. It comes from the soft fat around the kidneys and the loin of the pig, so has a neutral, non-piggy flavor. And, it’s recommended by the lovably cranky founder of Cooks Illustrated magazine, Chris Kimball. In fact, Kimball had many years ago piqued my interest about leaf lard in a column he wrote for the magazine. But being unsuccessful finding it in the grocery store, I hadn’t had a chance to experiment. Then, a few months ago I was reporting a newspaper story about a butcher, and as I watched him cut up a pig, he pointed to the leaf fat. He went on to lament that there was no market for it. Rather than going into flaky pies and crisping up fried chicken, the fat was sent out with the other scraps to a protein recycling company. I told my friend Ellen about it. Unlike me, her family had kept alive most of the old food ways, from shearing their own sheep to raising their own eggs. She too missed the flavor of perfectly fried potatoes and onions, and the flaky, moist pie crusts leaf lard yields. My mother went further, feeding me almost exclusively from boxes and cans. When I left home at 18, I swore I would never eat another serving of “instant” mashed potatoes. 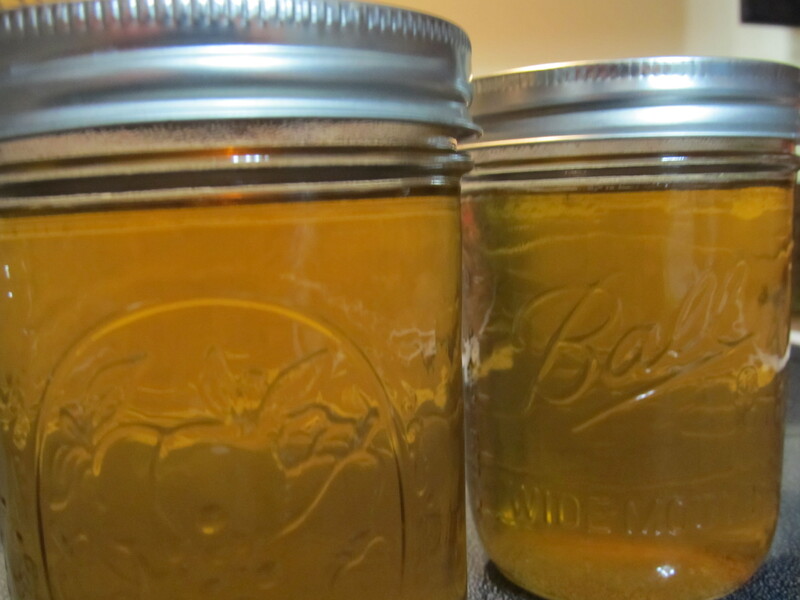 Hot jars of honey-colored, rendered lard. Photo by Tonia Moxley. According to a recent piece in Food&Wine magazine, lard contains just 40 percent saturated fat, compared with nearly 60 percent for butter. Its level of monounsaturated fat (the “good” fat) is 45 percent, double butter’s 23 or so percent. Because lard can be heated to higher temperatures than olive oil or butter, food fried in it absorbs much less fat. 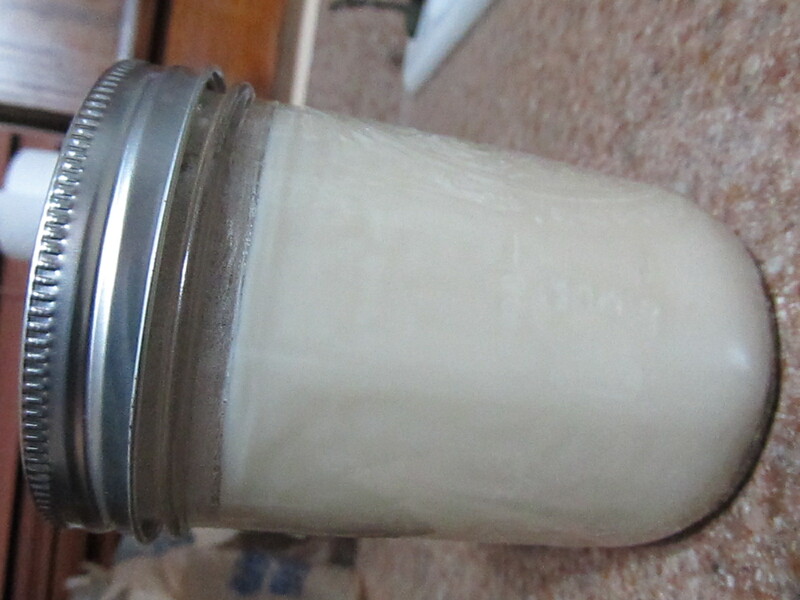 On Sunday morning, I picked up each pint jar of lard, now turned a milky white. I peeked in the freezer at the gallon Ziploc bags full of cracklin’s. Then I turned back to my Christmas list, and, like Santa, marked which had been naughty, and which had been nice. Cooled jars of lard ready for pie-making. Photo by Tonia Moxley. of this, gather the dough into a circle, wrap in plastic wrap and place it in the refrigerator for 30 minutes (or 10 minutes in the freezer). Remove from plastic, and roll into a circle large enough to fit a pie or tart tin. Use according to the directions for whatever pie you’re making. Tonia Moxley is a Virginia-based journalist and freelance writer who excels in the kitchen, but dislikes shopping for a bathing suit. Jim Fiedler , a farmer at the Bardstown Road Farmer’s Market in Louisville, turned me on to lard when I stopped being a vegetarian. I had never thought twice about it as a kid — it was just what made fried chicken and fried potatoes good. Now to say I cook with it makes me feel like I’ve announced I’ve strapped an IV of pure fat to my person, but I don’t care. It still makes for the best fried chicken and fried potatoes and I’m joined Jim in proselytizing that people cook with it instead of horrid fake stuff. I haven’t tried the leaf lard yet, but I’d love to make a pie with that recipe!